Classic literature, like Homer's the Iliad, is extremely difficult to read. The issue is not the language itself, but all those obscure cultural references. Just to name a few : Chyses, Chryeseis, Myrmidon, Briseis, Thetis, Therstises, and Diomedes. Any ring a bell? Kudos to you if you know any of them, but I’m guessing most of you don’t have a clue. As a modern audience, we want to get lost in the story. Instead we find ourselves struggling to follow the narrative while guessing the significance of the many characters and place names that keep popping up with little explanation. Unless you are a scholar of ancient Greek literature, you will have to do a lot of guesswork. Of course, this wasn’t a problem for the original audience who would have been familiar with every reference. In fact Homer’s placement of constant easter eggs would have been a huge part of the fun. People would hear their hometown legends mentioned and be filled with pride. On the other hand, us trying to breeze through the Iliad would be like the ancient Greeks sitting through Avengers : Endgame without ever having watched any of the other marvel movies. The difficulties approaching the Iliad is unfortunate. For that work provides us with not only an epic that has stood the test of time, but also because so much of our own culture was influenced by the work. Understanding the Iliad is understanding our own culture. That’s why there are so many great lectures and books out there that break down the narrative. But that is not the same thing as approaching the actual text as an audience. If we rely on the cliffnotes, we are left relying on someone else’s interpretation instead of drawing our own conclusions. Determined to read the Iliad despite its daunting list of characters, I decided it might help if I listened to it instead. Afterall, as far as I know the Iliad was originally a spoken work performed by poets. I wanted to experience the epic in as authentic a manner as possible. 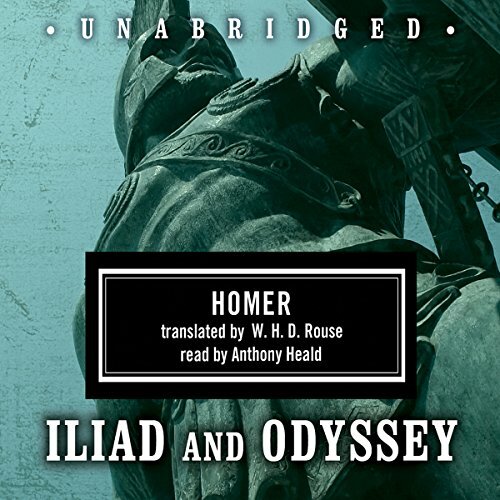 So I found an audio recording of the Iliad and the Odyssey on Audible. Surprisingly the narrator is the actor who plays the psychiatrist in Silence of the Lambs and wow did he do an excellent job. Why is he not famous! My first impression listening to the Iliad was that “this is the way to go.” This is how the piece should be experienced. I really do think the Iliad was meant for an audience’s ears and not their eyes. The use of repetition and the patient attention to details was clearly designed for someone doing something else while listening, washing the dishes or taking the dog for a walk. Now I didn’t expect that I would get from start to finish, but I did. I thought it would be one of those experiences where I could say, “Ok, I get what the Greeks would have liked about this work, but I’m not a Greek so two hours is enough to get the point.” Nope. I listened to all 13 hrs. And It was invigorating and inspirational. What allowed me to get to the end? It was “OK Google.” Whenever there was a character, and there were many, who I wasn’t familiar with I would simply hit the pause button and entrust the AI with the task of pulling up the information. I didn’t have to struggle to type in some weird Greek word. I simply repeated what I heard in the recording. This convenience (that I wouldn’t have had if I tried to read the piece) allowed me to follow the narrative while taking frequent reference checks. As a result, not only was I able to flow with the story, I also learned A LOT about Greek mythology. It doesn’t get any better than that! It might be an exaggeration to say that we can experience Homer’s Iliad just like its original audience, but we are a lot closer than we ever were before. And that is very exciting.